TROLL RESEARCH STATION, Antarctica - Into the Antarctic enigma, the puzzle of a place with too few researchers chasing too many climate mysteries, slowly waddles the elephant seal. The fat-snouted pinniped, 2 ugly tons of blubber and roar, is plunging to its usual frigid depths these days in the service of climate science, and of scientists' budgets. "It would take years and millions and millions of dollars for a research ship to do what they're doing," Norwegian scientist Kim Holmen said of the instrument-equipped seals, whose long-distance swims and 1,000-foot dinnertime dives for squid are giving investigators valuable data about a key piece of southern ocean. Climatologists and others say the icy continent has been monitored too thinly for too long in a warming world. Weather stations, glacier movement detectors, and research treks over the ice are too few and far between. "We're monitoring routinely a small portion of the continent. I'd say 1 percent," said David Holland, an Antarctic specialist at New York University. The reason to worry is clear: If all the land ice here melted, it would raise ocean levels 187 feet worldwide. That theoretical possibility would take many centuries, but "Antarctica is huge, so even a small change would make a big difference," said Jan Gunnar Winther, director of the Norwegian Polar Institute, which operates this research station in East Antarctica. Even a 1 percent loss of Antarctic ice would raise sea levels 2 feet, a slow-motion disaster for global coastlines. In 2002, the floating Larson B ice shelf fringing the West Antarctica peninsula, a piece of ice the size of Rhode Island, collapsed into the ocean, and the glaciers behind it began dumping land ice into the sea more quickly. Scientists are now watching for the imminent collapse of another peninsular ice shelf, the Wilkins. In a new analysis of the sparse data, scientists reported in January that Antarctica warmed by about 1 degree Fahrenheit between 1957 and 2006, contrary to earlier belief that much of the continent was cooling. In 2004, grass began growing on the warming West Antarctica peninsula. Last month, researchers reported on dramatic biological changes underway: a decline in plankton in the nearby sea, in the krill that feed on it, and in the penguins that feed on the krill. "Antarctica is changing rapidly in unpredicted ways," Holmen, the Norwegian institute's research director, told environment ministers and other international officials visiting this outpost in East Antarctica's icebound mountains in February. He said the shelf collapses in the west may eventually be replicated in the east. Computer models show that warming waters would weaken the 7,000-square-mile Fimbul ice shelf, which reaches 60 miles to sea from the coastline north of here, fed by one of Antarctica's largest ice streams, the Jutulstraumen glacier. It's a neighborhood the huge bull elephant seals know well, since they migrate over a 1,000-mile stretch of ocean between uninhabited Bouvet Island and the Fimbul shelf. "It was a stroke of luck that the seals swim in that area," Holmen said - a stroke that put the marine mammal with the protuberant proboscis in a position to do "field research." Institute teams captured 20 of the animals on Bouvet's stony shores where they are at their most ungainly, throwing hoods over their heads and gluing small instrument packages to their backs. The devices measure depth, salinity, water temperature, and locations via the Global Positioning System. The seals were then set free to do their work. 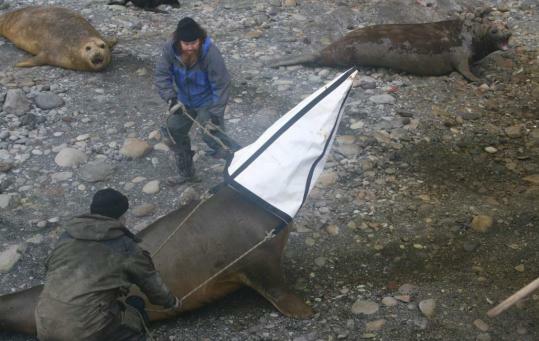 "Capturing elephant seals is not the easiest task," Holmen said, noting that one team member suffered a serious gash when a furious bull bit him. And the institute must find new candidates yearly, since the instruments will fall away with the seals' annual fur molting. But the deep-diving hunters have already come through for science, helping confirm that southern ocean temperatures are rising faster than the global average, the institute said. The seal data is proving "strategically important to climate and ocean modeling," it said.